As previously announced, Nordstjernan AB (“Nordstjernan”) has confirmed, through pre-acceptance, that the company is divesting its holding in the Norwegian furniture group Ekornes ASA (“Ekornes”) to a Chinese consortium under the management of the Chinese furniture company Qumei Home Furnishings Group Co. Ltd. (“Qumei”), provided that the transaction is completed. At the end of the acceptance period, Qumei’s offer had the support of 98 percent of the shares in Ekornes. On August 29, 2018, Nordstjernan sold its entire ownership share of 17.2 percent in Ekornes to Qumei. The offer for all the shares in Ekornes was equivalent to a value of NOK 5.1 billion. Nordstjernan initially invested in Ekornes in 2007, and has been the largest shareholder and represented on the Board of Directors since 2008. Since 2016, Nordstjernan’s Nora Förisdal Larssen has been the Chairman of the Board of Directors of Ekornes. Over the past few years, Ekornes’ management and Board has enjoyed great success in terms of rationalizing costs and the acquisition of the furniture company IMG, based in Southeast Asia. A unanimous Board recommended the offer from Qumei on May 23, 2018. In order to ensure a successful ownership succession, Nordstjernan will continue to be represented on the Board of Ekornes for some time. “Nordstjernan believes the new industrial ownership will create additional growth potential for Ekornes. We wish the company and the new owner constellation all the best in the future,” says Tomas Billing, CEO of Nordstjernan. SOMERVILLE, Mass. and SAN JOSE, Calif. — SmartBear, the leader in software quality tools for teams, will acquire Zephyr to create the most comprehensive set of test management solutions in the market. With this acquisition, SmartBear reinforces its commitment to provide software development teams with the most innovative tools to build, test, and monitor great software, faster. The popularity of Zephyr for Jira has catapulted it to become the No. 1 grossing app on Atlassian Marketplace with 18,000 teams using its tools to execute over 40 million tests. SmartBear will continue to extend and deepen the Zephyr product line and strengthen its relationship with Atlassian by leveraging SmartBear tools to bring more value to the users of the Atlassian Marketplace. Supporting more than six million software professionals and over 22,000 companies in 194 countries, SmartBear is the leader in software quality tools for teams. The company’s products help deliver the highest quality and best performing software possible while helping teams ship code at nearly impossible velocities. With products for API testing, UI testing, code review and performance monitoring across mobile, web and desktop applications, http://smartbear.com equips every development, testing and operations team member with the tools to ensure quality at every stage of the software cycle. For more information, visit: http://smartbear.com, or for the SmartBear community, go to: LinkedIn, Twitter or Facebook. The company’s products help deliver the highest quality and best performing software possible while helping teams ship code at nearly impossible velocities. With products for API testing, UI testing, code review and performance monitoring across mobile, web and desktop applications, SmartBear equips every development, testing and operations team member with the tools to ensure quality at every stage of the software cycle. For more information, visit: http://smartbear.com, or for the SmartBear community, go to: LinkedIn, Twitter or Facebook. Pittsburgh, PA — NEP Group, Inc., Crestview Partners and The Carlyle Group (NASDAQ: CG) announced today that Carlyle Global Partners, Carlyle’s long-duration private equity fund, has agreed to acquire Crestview’s remaining shareholding in NEP. Carlyle initially invested in NEP alongside Crestview and Management in June 2016 and, following this transaction, will hold a majority interest in NEP. Carlyle will continue to support management’s strategy of building a diversified worldwide outsourced technical production partner supporting premier content producers of live sports and entertainment. For over 30 years, NEP has earned the respect of the industry by raising the bar in technical management, production support and engineering. NEP provides vital technical resources and the industry know-how to help clients make, manage and show the world their content ‒ anywhere, anytime, on any platform. The company’s 3,500+ employees are driven by a passion for superior service and client-focused innovation. NEP’s global scale and local service is supported by the industry’s largest inventory of resources, including 160+ mobile units / OB vans, 40+ broadcast flypack systems, 44 studios with custom control room capabilities worldwide, 40K+ square meters of LED, 40+ live event production flypacks and innovative software-based media management solutions. NEP’s global headquarters is located in Pittsburgh, Pennsylvania, and it has operations in 24 countries and the ability to service clients worldwide. Carlyle launched its longer-duration private equity strategy, Carlyle Global Partners, in 2014 to pursue opportunities that leverage Carlyle’s expertise, resources and global platform in investments that benefit from longer hold periods and structural flexibility. The fund has made eight investments to date. Jones Day served as legal advisors to NEP on the transaction. Paul, Weiss, Rifkind, Wharton & Garrison LLP served as legal advisors to Crestview on the transaction. Debevoise & Plimpton LLP served as legal advisors to Carlyle on the transaction. J.P. Morgan Securities LLC, Barclays and Patricof Co served as financial advisors to the Company. Berenson & Company, LLC served as financial advisor to Carlyle. The transaction is expected to close in Q4 2018.
International private equity firm, Cinven, today announces that it has successfully completed the final sell down of its remaining shares in Nasdaq-listed Medpace (‘the Group’), a leading contract research organisation (‘CRO’). Following this transaction, Medpace becomes a fully realised investment for Cinven, generating highly successful returns for the Fifth Cinven Fund. Headquartered in Cincinnati, Ohio, Medpace is a global CRO operator providing management services to the R&D departments of pharma, biotech and medical device clients to help plan and oversee their clinical trials. Medpace focuses on small to mid-size companies and has significant expertise in numerous therapeutic areas, operating across 36 countries worldwide. Cinven’s Healthcare team identified the CRO industry as an attractive market in which to invest. Following its detailed sector review work, Cinven acquired Medpace in February 2014 for a total consideration of US$915 million. Investment-led growth: Significant investment was made into Medpace’s human capital and infrastructure to position the Group for further growth. In particular, Cinven enabled the senior management to make the strategic hires necessary to grow the business. Medpace’s workforce increased by more than 55% during Cinven’s investment, with the number of employees growing from approx. 1,500 in 2014 to 2,700 today. As a result, Medpace delivered strong financial performance under Cinven’s ownership, driven by trading growth momentum, industry-leading margins and strong cash conversion. On the back of this strong performance, in August 2016, Medpace achieved a highly successful all-primary IPO on the Nasdaq Global Select Market at US$23 per share. Medpace’s share price has performed well in the aftermarket, and Cinven has monetised its investment in Medpace through a series of sell downs, culminating in the final sell down on 22 August 2018 at a c.138% premium to the IPO price. “Cinven’s investment in Medpace stemmed from a high conviction thesis that we developed within Cinven’s Healthcare Team, which anticipated strong growth in the CRO industry fuelled by increased R&D spending by the pharma industry and the growing complexity and number of clinical trials required to bring new molecules to market. The transaction is expected to close on or around 27 August 2018 subject to customary closing conditions. The final realisation of Medpace follows Cinven’s recent successful exits of CeramTec, CPA Global, Viridium Group and Ufinet Group. We are very happy to announce that we are leading the €1.2 million seed round in retail promotions pioneer Formulate. Existing angel investors also participates in the round. The round enables the company to continue to grow the tech team, and let more retailers to optimise their promotions. For many retailers, promotions are one of the single largest items in the marketing budget. At the same time, most traders still go with the gut feeling as the basis for promotion investment decisions worth millions. Therefor, 20-50 procent of all promotions generate no noticeable sales lift. Formulate want to change that, and let retailers take control of their promotions. – Retail is changing fundamentally. Both physical stores and e-commerce need to work more data-driven and customer-friendly to remain relevant. Formulates service gives retailers deep understanding of a large part of their marketing, that previously been too complex to understand. We are truly impressed by Formulate’s drive and product focus, says Sara Resvik, Investment Manager at Industrifonden. Formulate DecisionCloud is the first easy-to-use analytics platform in the market that gives retailers the facts and forecasts they need to make better promotion decisions. Using technology based on AI, Formulate detects complex patterns in retailers transaction data and let them see which products, discounts, brands and suppliers that grow their business. Formulates DecisionCloud analyzes standard receipt data from both e-commerce and physical retailers, and takes into consideration how purchases for non-discounted goods and categories are influenced by promotions, how season and weather are driving sales, and what deals are the most effective in different parts of the assortment. 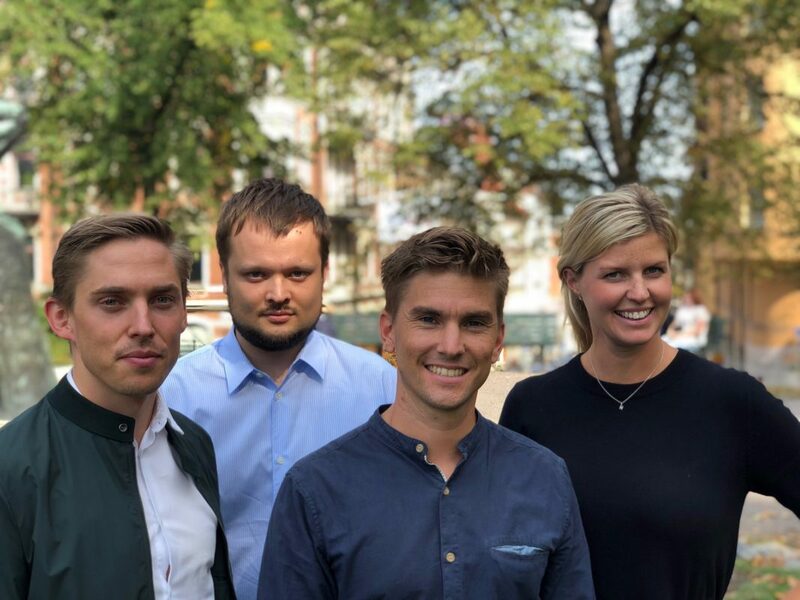 – We’re thrilled to start working with Industrifonden. The investment enables us to do more in less time, which is needed as retailers have to pick the right technologies and implement fast to make themselves relevant. Easy-to-use AI that helps retailers make better business decisions is the future, and we believe our service can dominate how retailers optimize promotions, says Andreas Willgert, founder and CEO of Formulate. We are truly excited to join Formulate on their journey to allow more retailers to control the profitability of their promotions. Welcome to the family!